We live in a very special time period where God has paused His preordained clock dealing with the Jews and allowed Gentile Believers to be grafted into/adopted into the rich root of the olive tree— the Jewish promises given to Abraham and the prophets. Yet few Believers understand their Jewish heritage. 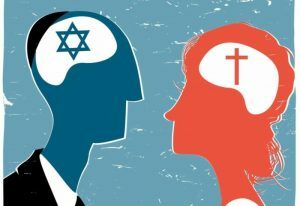 In fact, Satan has convinced 80% of the professing Christians to believe that the Jews rejected their Messiah and therefore the Church has inherited the promises given to the Jews. Of course, that’s simply not true. Anyone with two brain cells should be able to read Romans chapters 9-11 and see God’s not finished with His chosen people. Once the preordained time period we call “The Church Age” is completed, God will remove all the Born-Again Believers and go back to dealing with the Jews again for 7 years. But in the meantime, even premillennial, pro-Israel Believers today are missing so much by not understanding our rich Jewish roots. For instance, the sacrificial system God had ordained for the Jews is fascinating under scrutiny. 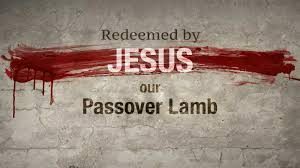 Let’s look closely at what the Passover sacrifices entailed in the first century as it overtly pointed to the death of the Messiah. When John the Baptist thundered, “Behold the Lamb of God who takes away the sin of the world” it would have resonated deeply with every Jew standing on the bank of the Jordan River. None would have missed the obvious connection being proclaimed because they lived in a world where God commanded innocent lambs to be continually sacrificed to pay for sin. These sacrifices to the Lord go all the way back to Cain and Abel (Gen. 4:4-5) and later Noah (Gen. 8:20-21). 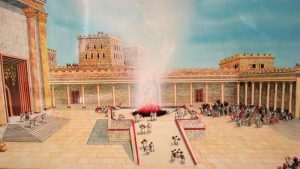 Personal sacrifices were made in the open-air plaza in front of the Jewish Temple at various times during the year, as prescribed by God in Leviticus. 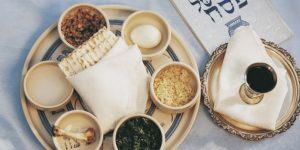 While the Day of Atonement each fall was the most important feast, it was the Feast of Passover in Jerusalem each year that was the most celebratory. It is simply hard to imagine! 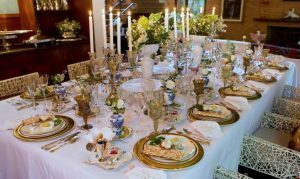 Passover dinner is a big deal each year for even nominal Jews. 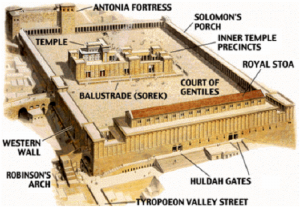 Passover was held in Jerusalem each spring, and every male over the age of 20 mandatorily had to attend. There they would join over two million fellow Jews making their sacrifices of an unblemished one-year-old male lamb and eat the Passover dinner. During the meal, God commanded that they recount Moses and the miraculous exodus from Egypt when the Lord “passed over” the Jews on that same day 1450 years earlier. A major part of the exodus event was that the death angel passed over only those who had been covered by the blood of a lamb on their doorposts. Two million Passover attendees in Jerusalem each year astonishingly required some 20,000 sacrificial sheep to be slaughtered in a single day—between 9AM and 5 PM on Nissan 14 on the Jewish calendar. The organization by the Levites who were charged with the monstrous task staggers the mind. Many Jews raised their own sheep for the yearly Passover sacrifice. But most did not and would instead purchase an approved lamb outside the Sheep Gate. The bulk of the sheep were raised five miles to the south in the grass pastures surrounding Bethlehem. Our Savior, called the Lamb of God, was born in the middle of all those sacrificial sheep. A few days before Passover, the shepherds would carefully bring thousands of sheep north from Bethlehem through a series of valleys ending in the Kidron Valley. It’s situated between the towering Temple Mount walls to the west, the steep sides of Mount of Olives to the east and Mt. Scopus to the north, making a natural pen for the thousands of sheep. 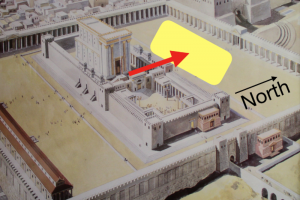 Near the north end of the Temple Mount’s east facing wall was the Inspection Gate where the sheep were inspected in order to be declared “unblemished.” Once deemed to be acceptable offerings, the sheep could then be sold as Passover Lambs. Sacrificing 20,000 sheep in one place in one day was so spectacular that the Roman ruler, Pontius Pilate, would travel from his luxury Roman palace in Caesarea on the Mediterranean Sea to Jerusalem just to watch the day-long event. Pilate even had a special high tower built on the southeast corner of the Roman Antonia Fortress. From there he could peer over the Temple Mount’s walls and view the mesmerizing sight of some 40 lambs being sacrificed every minute. To perform this many sacrifices in one day, by necessity, meant most of the sacrifices were slaughtered in the area between the Temple Compound and the Antonia Fortress, north of the Alter. 20,000 animals being sacrificed in one day! In Jesus’ day, imagine a freshly bathed Jew, with his 1/2 shekel Temple tax in his pocket and his sacrificial lamb draped over his shoulders, standing with thousands of other Jews with their lambs, waiting their turn to enter the Temple compound. As he got closer to the sacrificial area, he could hear the all-male Levitical Choir singing continuously from the balcony. The Levitical Choir included singers and musicians who played on trumpets, harps, lyres and cymbals. Once you were in the sacrificial area it was customary to sing along with the choir. Singing for the entire eight hours of sacrifice required five groups of 100 singers rotating every 30 minutes. The deep base lyrics and musical accompaniment drowned out most of the sounds of the scurrying Priests and bleating sheep. When you reached the front of the line, the lamb’s throat was slit by a priest who simultaneously caught blood in a cup. The cup was passed down a long succession of priests until it was thrown at the base of the great altar. wheeled to the Altar located in front of the Jewish Temple. The entrails were removed and wheeled to the top of the altar, where a roaring fire burned the quite-greasy innards of the lambs. The flames burned throughout the day, leaping 30 to 50 feet into the air—so high Herod remarked he could see them from his palace on the other side of town. The amount of blood from so many sacrifices at one time apparently was a problem. 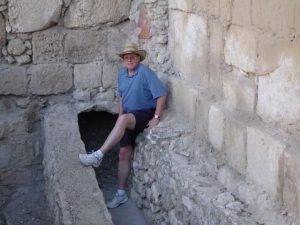 In the picture above, I’m standing in front of a huge drain discovered about 20 years ago that comes directly from the sacrificial area. All that blood, as well as the history of the ages, flowed to the Dead Sea. NOTE: Today, cosmetic products made from Dead Sea mud seem to have special healing powers. Many European insurance companies cover expenses to the Dead Sea for treatments of things like psoriasis and other skin problems. With the entrails removed and the blood drained, the carcass was then taken back to the family to roast and eat for the Passover dinner. The entire carcass had to be 100% consumed before morning. With an average lamb producing some 50 pounds of meat, a single lamb would feed around 100 members. An average extended Israeli family in Jesus’ day would easily have 100+ members celebrating the Passover together. But smaller families would have to combine together in order to consume the entire lamb before sunrise. The meal began with the children going to the front door to see if Elijah was there. Jews to this day still set a dinner place for Elijah and send the kids to the door to see if Elijah has returned. They, of course, don’t understand that when Elijah does show up he will be one of the two witnesses described in Revelation 11 who are prominent in the first 3 1/2 years of the Tribulation. With Elijah not at the door and the house meticulously cleaned of leaven, the famous celebratory dinner could then begin. It included four glasses of wine spaced through the evening, and often the celebration stretched into the wee hours of the morning. unleavened bread) and accounts of Moses and the Egyptian Exodus retold to wide-eyed children. 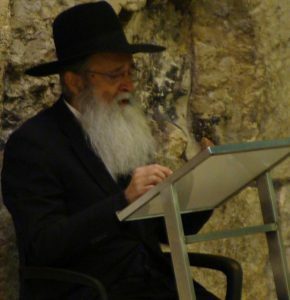 But there was another interesting characteristic of the days leading up to Passover. While the rest of the world worshiped multiple gods, the Jews worshiped one God, Yahweh. And Yahweh promised a future Redeemer would come and rule the world from Mt. Moriah in Israel. With the Romans holding a tight grip over the Jewish nation, every Jew longed for God’s promised Messiah to appear. Most Jews expected another Moses-like Redeemer. And, like Moses, they expected their Messiah to show up on Passover. So Messianic fever reached its zenith each year at Passover. But it had been over four hundred years since God had communicated with the Jews through a prophet or a miraculous physical sign like Moses parting the Red Sea. Israel longed for those historical days again providing relief from the despised and cruel Roman Empire rule. So Israel longed for her Messiah to arrive. Just like “prophecy buffs” today, watching and waiting for the return of their Messiah, there were those at the time of Christ who also lived and breathed prophetic scripture. Based on Daniel 9:24-27, some had calculated that they were in the window of time predicted for the Messiah to show up. So it was amongst this national Messianic fever at Passover that God Himself shows up in the flesh and begins fulfilling all the Old Testament prophecies. To the prophecy buffs of the day, Jesus must have been exciting to watch as He fulfilled one prophecy after another. They KNEW the Messiah had come. Unfortunately, most missed the part where the Messiah had to first come as a sacrificial lamb, then return later as a King. But the prophecy buffs of the day were well rewarded for their attention to scriptural detail. No doubt many of them became Believers when all the dust settled and the Holy Spirit came rushing down to earth on Pentecost, 50 days after Jesus was crucified. All because they dug deeply into scripture.